Do you have a "Bucket List" - you know that list of things you want to do before you kick the bucket. Well I do have such a list and yes I am working through it. One of my "Bucket List" entries is to travel around Australia in a Camper Trailer. 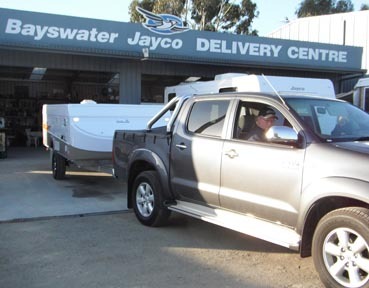 Shane and I have been planning it for quite a few years, every year we would head off to the "Caravan & Camping Show" and dream over all the tent trailers, camper trailers, motor homes and all the bits and pieces that go with them. But our last "Caravan & Camping Show" was the decision making time - we decided it was time to make our purchase. We bought our new camper trailer but had to wait 6 months to have it built. Yesterday was our day to go and pick it up. It is pretty easy to tow, but as it was brand new and we were in peak hour traffic on the way home we were both a bit nervous. But we got it home and now it's time to really start planning for our "Bucket List Trip". Although it won't be a huge trip for a while yet seeing I am enjoying my "Year In Daylesford" at the moment. Yay! Good for you Davine, I hope that many good memories are made with this trailer. I'd love to see inside once you get the time to really inspect it. Have a wonderful day! Can't wait to read about all the wonderful times you have with your camper.